EVE's "learning cliff" is notorious. How do people learn how to ascend the cliff? The in-game tutorial and pop-ups aren't up to the task. Online documentation is incomplete and often inaccurate. Mostly, players rely on other players to help them learn the game. However, bot-aspirants prefer to play solo, even when they join corporations. Thus, they are insulated from the very knowledge that they'd need in order to try the fun aspects of EVE. It's a hopeless situation. ...Enter the New Order of Highsec. Agents Liek DarZ and Plasma Death discovered an unlicensed miner and swiftly began to teach her about the game. Liek DarZ > Did you not know that mining in hisec without a New Order permit is not allowed under the rule of James 315, the savior of hisec? If you want to mine here, you need to have a valid license and follow the rules of the CODE. Fewer miners are claiming ignorance of the Code these days. Though she'd only played for a few months, Qila was ready to become a space lawyer. Liek DarZ > Well, maybe you should have convoed? I had just passed probably and was not in there any longer. Liek DarZ > I even state all the time "convo me for details"? Once upon a time, all the miners denied the existence of the Code. They tried to downplay its importance. Now miners try to use the Code to argue with their gankers. Liek DarZ > You are not a follower of the CODE. Liek DarZ > You do not display a permit, for starters. Qila declared herself immune from ganks, thanks to her status as a Code-compliant miner. However, she lacked a permit. Indeed, there was no evidence that she followed the Code, and plenty to the contrary. Even her pod failed to escape following the destruction of her Retriever--a clear sign of being AFK. Our Agents are expert at spotting Goofuses. Allowed to speak his mind, the Goofus will reveal himself. Gallants are always respectful and deferential to our Agents. Liek DarZ > Bad tank, a single stab does not help at all. Liek DarZ > Careless as well - lost pod in hisec? Liek DarZ > No permit also. The self-righteous miner knew she was losing the argument. She expressed doubts about the Saviour of Highsec. Talk about a red flag! Liek DarZ > Want to repent your sins and become CODE compliant? Qila McClusky > Oh , you maggot . I would, but now my EYES ARE OPEN AND I CAN SEE THAT CODE IS NOT PURE ANYMORE. Liek DarZ > u-huh. Sure, go ahead, and die again to our law enforcement if you prefer it that way. Qila McClusky > Just because i have trust in James, please puit me in contact with one of your broothers so i can purchase permit, as you are not worthy of my attention. The miner considered herself superior to the Agent who had bested her in PvP. What a contrast with the Gallants, who are grateful for every second that an Agent chooses to speak with them. Liek DarZ > I am sorry, none of my brothers will agree to hand you a valid permit if he knows you were not treating me with the proper respect (which I still gave to you, but meh, we are used to that from criminals). Liek DarZ > See, there is your lack of respect again.Calm down, miner! Qila McClusky > now much is permit, how other will know(what warranty i have ) ? Qila McClusky > what are the rules ? Qila McClusky > no AFk ? Qila began to soften a bit. Liek DarZ recognized the opening and sent her links to MinerBumping. Perhaps Qila was also receptive to a little constructive criticism about her Retriever fit? Liek DarZ > why, again, a single core stab to start with? Liek DarZ > I could see two, but why one? Liek DarZ > a single stab does not stop any gank. Since gankers use short-range weapons anyway, they tend to use 2-point warp scramblers. Our Agent gently explained this concept to the miner. Qila McClusky > so in short , i need permit and then i can mine safely from CODE ? Liek tried to encourage Qila to fly a more heavily-tanked mining ship instead, such as a Procurer. Though resistant, once Qila acknowledged Liek's EVE expertise, everything went swimmingly. ...Or so it seemed. Qila never bothered to buy a mining permit. And the very next day, Liek had a chance encounter with her in an ice anomaly. Liek was stunned to see that Qila had learned nothing at all. In fact, she had used his advice as an excuse to swap out her warp core stab in favor of more yield! Liek DarZ then attempted to convo Qila to find out why she had failed to absorb the previous day's lesson. 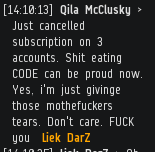 But Qila McClusky offered no response; she was AFK. When Qila finally returned to her keyboard, she wasn't interested in private convos. Instead, she announced her feelings to everyone in Osmon local. Surrounded by an audience of her peers, would Qila finally show signs of being a better-educated miner? Oh no. 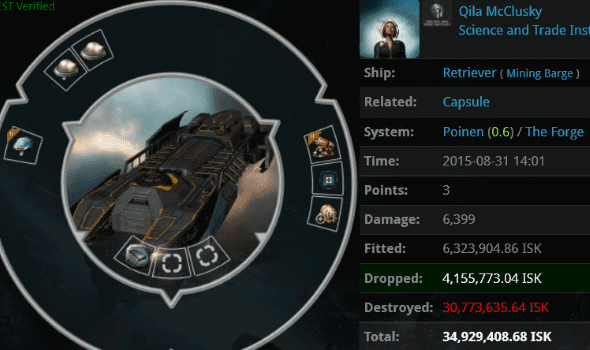 Eve lost another silent, AFK miner. The game will never be the same. Thank James it's a chance for the better. What could possibly follow such an opening tour de force? The story seems complete. Qila attempts to deceive a stalwart of the New Order, fails, flounces out taking her 3 accounts with her. EVE is spared. I'm totally (and hungrily) awaiting the next episode, but isn't it KOTW tomorrow? You know I fear for these type people in rl. Do they lay down and quit when faced some some rl adversity? Is that how they conduct themselves at work or school when they are told to do something they don't like doing. IS THAT how they talk to their mother, when she tells them to come out of the basement for once each month and take the trash to the curb? At 10:30AM PDT a lone gunman who CONCORD police describe as a notorious high-sec ganker walked into a community college campus and opened fire killing 15 miners and freighter pilots in three class rooms and injuring at least 20 more. During the shooting, a former soilder for the Caldari Navy and a veteran of the Caldari-Gallente war tried to stop the gunman and was shot 5 times. When CONCORD police arrived on scene, the gunman exchanged fire with the police. The gunman then did what every highsec ganker does: commit suicide. During a press conference, CONCORD spokes person, that CONCORD guy, announced that the identity of the gunman was none other than Loyalanon, CEO of The Conference Elite and executor of the CODEdot alliance. "Loyalanon is well known to us. He has committed many acts of violence and terrorism against the good people of highsec." Knowing that the gunman was Loyalanon, CONCORD forces at the medical station where Loyalanon's medical clone is registered at waited for him to awaken in his medical clone before taking him into custody. According to witness statements, Loyalanon was asking people if they were from the Amarr Empire. Those who responded yes were shot. People who appeared to be AFK or paid no attention to him were also shot. "We know his motivation is for the death and destruction of miners and haulers," the CONCORD guy stated. "However, what we don't know is the motivation against those from the Amarr Empire." The investigation is ongoing. FakeBM. You really are the vilest, sadest pedo i know. @Butthurt, Dude/ette poor taste, very poor taste indeed, you should be ashamed of that post. Be pissed at James and his Motley Marauders of Mayhem by all means, but bringing stuff like that up is uncalled for and obnoxious; even more so given recent tragic events, which is exactly why you posted it. One less miner, one more step to a carebear free Highsec! All glory to the New Order! All hail the Code and it's magnificent creator, James 315!! The tears being shared here are delicious. Thank you miners.